Organic veg, harvested to order, Straight from the field to your door... what’s not to love? Our boxes are packed with veggies which have been grown with lots of care and attention. Unlike other veg boxes, everything you get in your box will come from our own farm... that way you know that it’s always fresh, seasonal and local. We want to make sure that you get your hands on our produce when it’s at its freshest, so we only ever harvest our produce the evening before or on the morning of delivery. The box contents vary from week to week and with the seasons, but are primarily vegetable based with the occasional addition of herbs or fruit. In the springtime the boxes generally have lots of leafy greens.. think spinach, spring cabbage, kale and salad. During the summer the variety is much wider, including tomatoes, peppers, potatoes, courgettes, squash, raspberries and lots more! The autumn boxes see the addition of Brussels sprouts, leeks, carrots, and turnips. We deliver to Perth, Dundee, St Andrews and Falkland. However, if you live somewhere else and are interested in a box send us an email and we’ll do our best to accommodate you. Boxes can also be collected from the farm by prior arrangement. If you order between Friday and Tuesday your box will be delivered on Thursday. If ordering on a Wednesday or Thursday your box will be delivered the following Thursday. We are very happy to leave the box anywhere you think it will be safe. If you live somewhere where there isn’t an ideal place to drop off the box then we can organise for it to be collected from one of our pick-up points or from the farm. Please send us an email to discuss the options! Can I order a one-off box or do I need to make a weekly commitment? You can order a one-off box for £12 including delivery. Weekly or fortnightly boxes are £10 including delivery. If you would prefer your box to be delivered fortnightly please send us an email to let us know. We understand that you may not need a box every week and we are very happy to reschedule deliveries. Please try to let us know by Tuesday if you want to reschedule your Thursday delivery. What if there are some vegetables that I don't like? 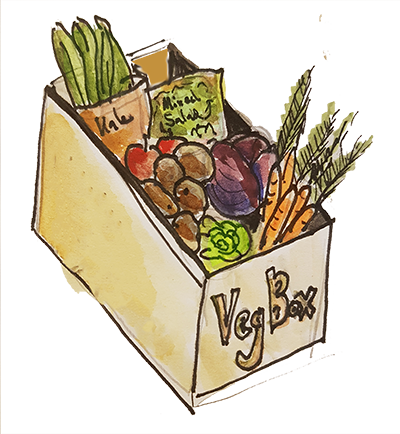 We try our best to make our boxes work for everyone so if there are certain veggies that you can't eat or just really don’t fancy, just let us know and we can arrange for a substitution. In general we can only accommodate one substitution per box. Do you supply veg boxes all year round? Our boxes are available from April - December. Unfortunately we can't supply veg boxes over the winter.. .we have a sneaking suspicion that even the most admirable of seasonal eaters might start getting a bit tired of sprouts and leeks after a few months (and we like to take a bit of a holiday! ).